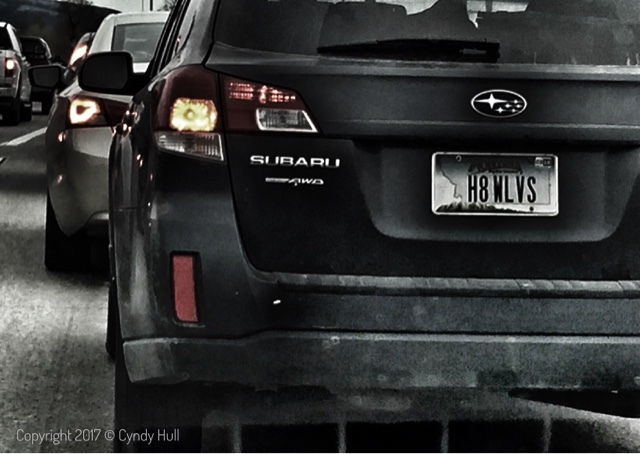 Well, there's a sentiment I didn't expect to see on a Subaru wagon in Montana: "H8 WLVS". I (literally) Laughed Out Loud reading this license plate at the stoplight - not because the statement itself is ha-ha funny, but because I needed a second reading to get it - only due to the seeming incongruity of its location on the back of this particular vehicle type. Good thing it was a long light. Wolves are a contentious topic in Montana, particularly in regions where they've been "reintroduced". I won't go into the bitter debates and gory details here, but feel free to click on the highlighted text links to get a brief intro. Should you want to delve, a Google search for "wolf debate in Montana" will provide plenty of fodder for deep dinner conversation. The Subaru drivers we typically see in Montana tend to love the outdoors and everything in it, exuding a 'live and let live' vibe often underscored by a plethora of bumper sticker messages. And a couple of tail-wagging dogs laughing out the back door windows.